I’ve just performed a kernel upgrade on my Raspberry Pi 3 to patch CVE-2016-5195 aka “Dirty COW”. Privilege escalation vulnerabilities in the Linux kernel always gets my heart rate going, so I decided to immediately get the latest kernel (4.4.26) and firmware for this server. 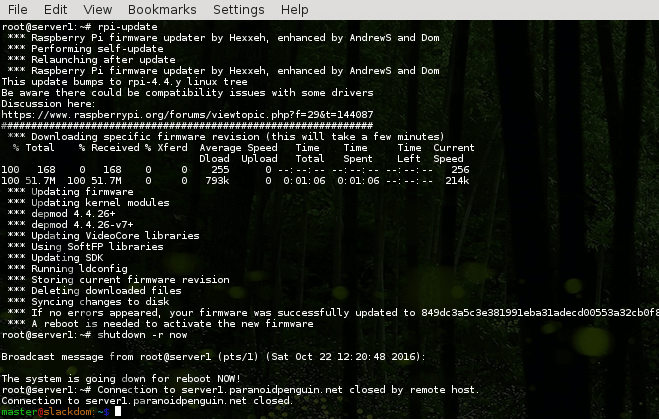 The tool I’m using for kernel and firmware updates is rpi-update by Hexxeh. Usually I would first deploy updates to my RPi based build boxes for testing, but desperate times call for desperate measures. Anyhow, I’ve not noticed any regressions or other issues so far, but with bleeding edge there’s always a risk. Rpi-update is intended for use with Raspbian but I’ve been using it on Slackware ARM for 18 months without issues. Still, before going down this path make sure it’ll work with your distribution. For all you IoT owners out there, it’s time to take some responsibility and start patching. Rpi-update on Slackware ARM installing the latest kernel and firmware.